Ten years ago, if you looked at a magazine stand, it would have been cluttered with photos of actors and pop stars on the covers of Vogue, Elle, InStyle and others. Now, the covers of these same magazines are dominated by everyone’s new obsession – the supermodel. Supermodels are taking over the world. Between the Victoria’s Secret fashion show and fabulous Instagram accounts, models such as Karlie Kloss, Candice Swanepoel, Cara Delevigne and Kate Upton have become household names. Most experts in the fashion and media industries agree that supermodels haven’t been known by their names since the reign of models like Kate Moss and Cindy Crawford in the ’80’s, but supermodels are now making themselves known with the help of social media. Karlie Kloss has 1.9 million followers on Instagram. Candice Swanepoel has 4.8 million followers, and Cara Delevigne? She has 9.5 million followers. This is a great time to point out that Drake, who has dominated the music industry for at least four years, has 7.1 million followers, and Ellen Degeneres has 9.2 million. Yep… fewer than a 22-year-old supermodel. 1. It’s like watching a piece of art walk and talk. A supermodel’s job is to be in front of the camera and to speak for brands and designers. They walk runways, but their personalities won’t exactly shine through at a Chanel Pre-Fall 2015 fashion show where their job is to be part of a display. So if Cara Delevigne Instagrams a picture of herself and Kendall Jenner, also walking in the show, in Mickey Mouse ears and 3-D goggles just days before they hit the runway, people are going to want to see it. If Karlie Kloss uploads a picture of herself and Taylor Swift (!!!) road-tripping like normal twenty-year-olds, people will want to see it. 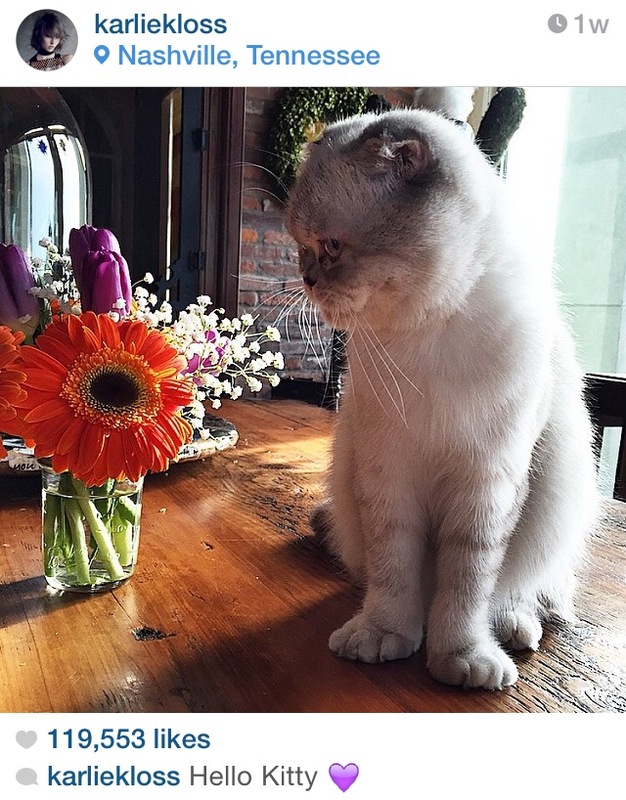 A picture Karlie took of Taylor’s scottish fold kitten?? I definitely want to see it. It’s the fascination of seeing someone so perfect be a normal person that brings us back for more. 2. They have fabulous lives and go to fabulous places. It’s almost a guarantee that if a supermodel is Instagramming a picture, she is in an insane location. Whether it’s Bali, Paris, or some remote island in the British West Indies, supermodels are traveling there for work, and Instagramming the chicest scenery along the way. 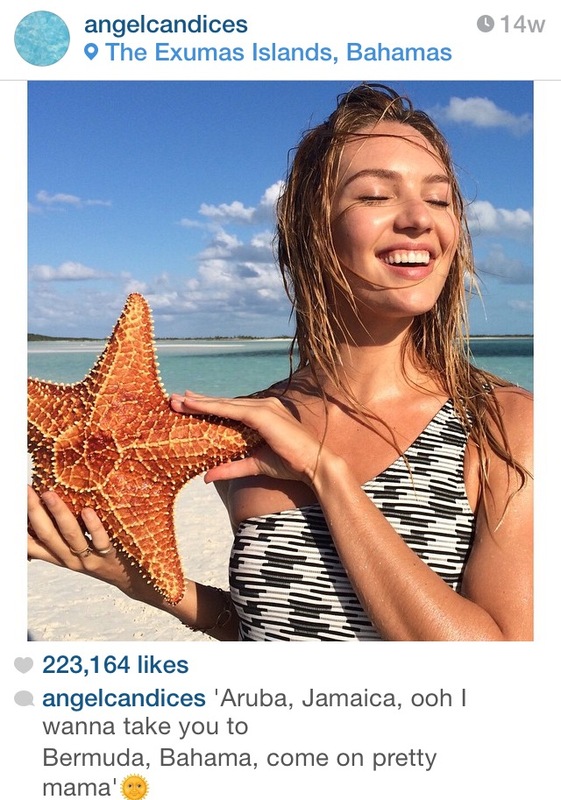 Nothing spices up your Instagram feed like a picture of Victoria’s Secret Angel Candice in the Bahamas holding a starfish, especially when the picture before that was of your friends’ matching Starbucks drinks. (Yawn.) Following a supermodel is like living vicariously through their amazing experiences, and everyone loves to daydream. Supermodels are dominating the media and it’s fascinating. As a lover of fashion, following an influx of supermodels taking pictures backstage with designers like Karl Lagerfeld is a dream. The supermodels who hold their own on social media are going to take the fashion industry to a new level, and I can’t wait to see it. Previous Why are Katy Perry’s sharks famous? Next Can you still read?